The holidays are almost upon us and if you are anything like me then you still probably have last minute shopping to do. (Actually, I have all my shopping still to do). 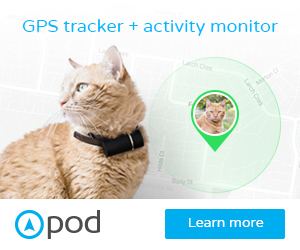 I love getting cat-themed Christmas gifts – usually anything from cat mugs through to funny books. 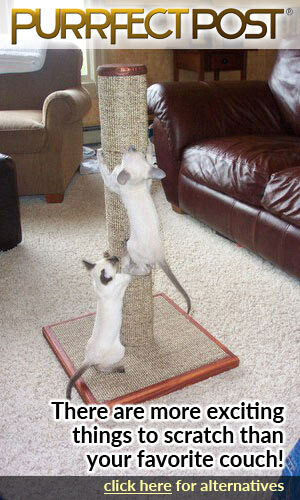 Most are usually small and can be stuffed in a stocking – others might be a little more expensive. 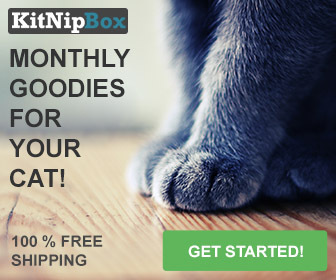 Well here at Cool Stuff for Cats we’ve gone and found you some cute Christmas gifts that any cat lover will love – and they don’t need to break the bank. So kick back and relax as all these items can be bought online. The little box signs are just 5 inches on each side and make a fun stocking stuffer or even a secret Santa gift for a co-worker. They are made of wood with distressed lettering and have smoothly sanded edges. Either hang them on the wall as an inspirational sign or place them on your office desk – it’s bound to make people chuckle. If you have a friend (or relative) who has lots of cats and a great sense of humor then this cute action figure will make a good stocking addition. 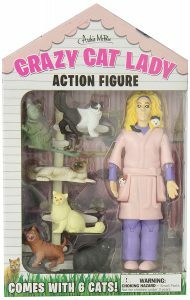 This crazy cat lady action figure is about 8 inches long and she comes with 6 cats all about 1 inch long. This is made from hard vinyl and anyone will get a laugh out of this on Christmas day. 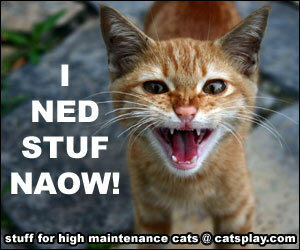 This adorable kitty is hard to resist especially if your friends love ginger or orange cats. 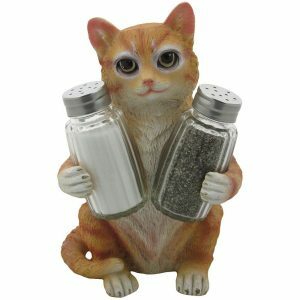 Measuring 4 5/8″ by 4 1/2″ by 7 1/4″ high this kitty cat is created from cold resin and he is holding glass salt and pepper shakers. 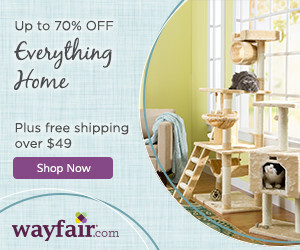 This cute cat also comes in black and white, calico and gray colored fur. Note that spices are not included. This is an amusing piece for a kitchen showing an inquisitive kitten that has bitten off more than he could chew. This wine bottle holder is sure to raise a few eyebrows and raise a laugh. 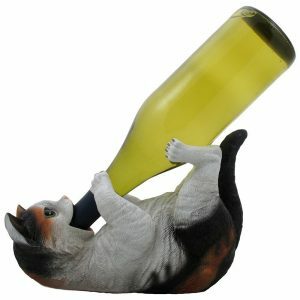 At 9 1/2″ x 4 3/8″ x 6 3/8″ high and weighing 2.3 pounds this is kitty is pretty stable as it holds a wine bottle between its paws. Made from a cold cast resin, you can also get this kitten in black and white, ginger and gray colors. Kitchenalia often seems to be the home of the quirky and unusual and these cat themed ceramic measuring bowls are no different. This set is made from glazed and hand painted ceramic and consists of four measuring bowls in sizes 1/4 cup, 1/3 cup, 1/2 cup and 1 cup. 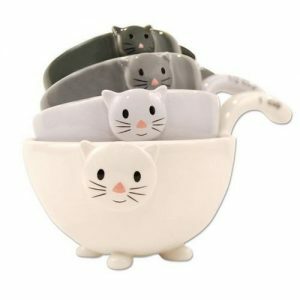 These measuring bowls have cute faces and their tails are shaped as a handle for easy holding and pouring. Give them as a gift to a friend or keep a set for yourself. 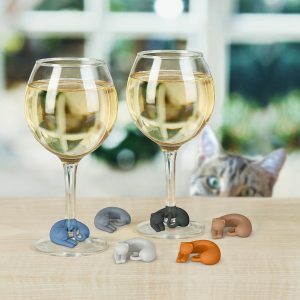 Never mix up your wine glasses again when you have friends visiting with these cute kitty drink markers. There are six different colored kitties in this set and each kitty wraps perfectly around the stem of a wine glass. Made of pure silicone, you just pop them around your glass when you have friends around for drinks so you always know which glass is yours. And if you give them as a Christmas gift then you can use them during Christmas lunch. 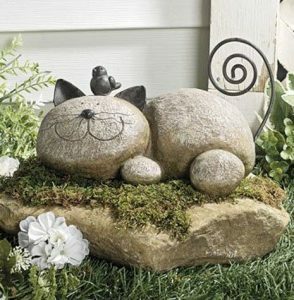 If you have a cat lover in your life who also loves their garden, then this resting cat garden ornament will make a great gift. This really cute cat measures 9 inches long by 4.5 inches high and 4.5 inches deep and is made from a durable lightweight resin so can be placed outside in the rain. This is pretty durable and as it is resin and not ceramic it is lightweight so easy to move. 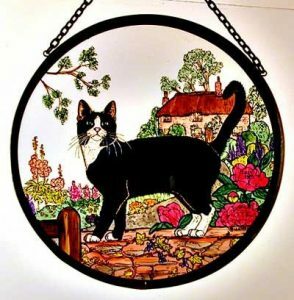 Beverley Gallagher of Celtic Glass Designs has designed and created this lovely looking suncatcher using a black and white cat walking on a country garden gate. As an artist, she specialises in hand painted Celtic, contemporary and Mackintosh inspired glassware. 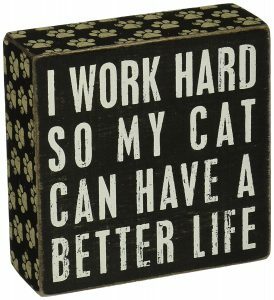 In the case of this distinctive piece the colors positively glow and I think that this would make a thoughtful gift for any cat loving friend or relative. The suncatcher measures 6 inches by 6 inches and can be hung near a window or door to catch the light. However, because of the bright colors it is best to avoid strong sunlight – so look for a shadier window.